Form 3 student accepting her prize of a laptop for coming 4th out of 2890 students in the Hai District exams. New exams have been introduced by the government to test that schools in Districts around the country are performing adequately. WATU Secondary is in Hai District, a region of 40 schools and approximately 3,000 pupils. The results for Form 1 and Form 3 confirm how well the school is doing in all 9 subjects. In Form 1 WATU Secondary is placed 6/40 schools. The most pleasing results were in the sciences( e.g. Biology 1/40 ) and in no subject was the school placed below 7th position. In Form 3 the results were even better, 1/40. Again the science results were excellent 2/40 in Physics, Chemistry and in Maths. There was ,of course, great excitement amongst staff and students at such excellent results. Congratulations! The fact that donations have provided the school with a lower school lab facility is now paying dividends. The school still lacks upper school science facilities and a new lab. is the next most pressing need. The 7th January saw the start of the new academic year, and how pleasing it was for the students and teachers to be welcomed back with the news of yet more successes in examinations, this time Year 2 national exams and the Year 6 mock ‘A’ levels. Year 2 exams are an opportunity for the younger students to experience the preparation and the sitting of serious, external exams before the all important year 4 ‘O’ levels and this year our students did so well that their results places them near the top of national school rankings. 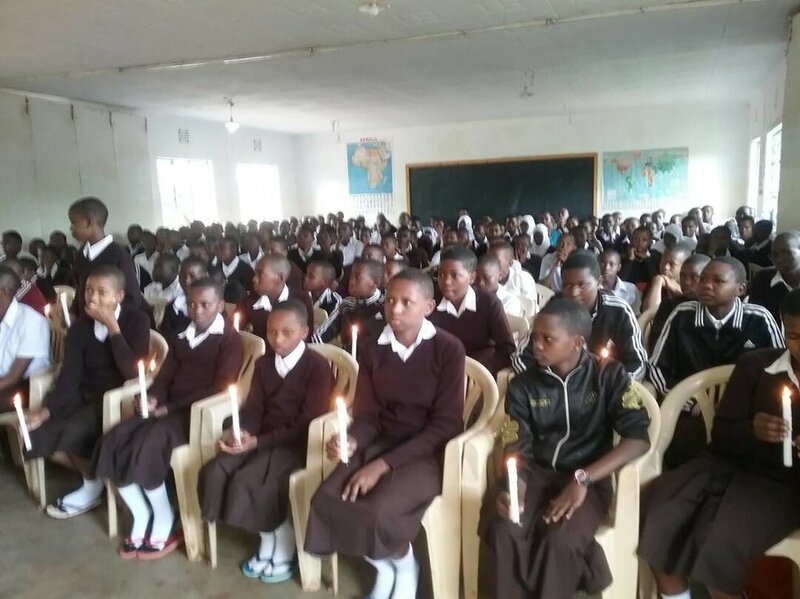 The mock ‘A’ level exams placed the year 6 students 13th out of 66 schools in the Kilimanjaro region., and there’s time to improve still further before the final exams in May. Congratulations to all the students and staff. Such great results are not only pleasing for the school community but it is also verysatisfying for donors to see how well the school is performing. Once again we are very proud of the achievments of our 6th form students in their A level exams. 14 students were entered and 11 of those students achieved high enough grades to qualify outright for university admission. The remaining 3 may also be admitted, depending on the general pass level. These results place WATU Secondary School nationwide 27th out of 127 schools of our size and 6th out of 16 such schools in the Kilimanjaro Region. We have to thank the students and teachers for all their hard work and all those who gave support and encouragement during the study and exam periods. The new boys' hostel extension is now being used by form V, VI and a few from IV. The electricity has been installed so that the boys can read and study at night and with so much space everybody is really happy. Huge thanks go to both La Chataigneraie Tanzania group of 2017 and the CDL 2017 Watu group who accessed a grant from CIS. Both of these Geneva international schools have been incredibly supportive over a long period of time. A development that has only been made possible by the donations of laptops and the broadband tower installation is the production of the students’ own newsletter or magazine. With the help of Mr. Deo and Goodluck, they have now produced two editions (see the newsletter page). Already they have been sent out to a number of schools both international schools, in Geneva, Mexico, Austria and Singaporeand a number of national schools in Britain. Hopefully some of these schools will develop links with our students via the WATU Secondary School Facebook page or by producing a similar newsletter for WATU students to enjoy. Such global contact is one of the more unusual but very important aspects of our school, one that can surely develop in the students a greater awareness and understanding of the wider world. WATU Secondary School has welcomed pre-form 1 students to attend classes during the long break between the end of their primary education and the start of the secondary classes in January. The parents are pleased that their children have this extra opportunity to both get used to a secondary school atmosphere and to start work on the curriculum. Some of the 60 students will be attending WSS in January. May 10th was the occasion of the 2016 graduation, the third to take place at the school. The guest of honour was Mr. George Lugata, the Zonal Director for TIGO, the supplier of our internet connection. The students had just finished their final 'A' level exams on May 6th so were able to relax and really enjoy the day along with their proud parents/guardians and the staff of the school. Well Done to you all and we wish you every success in the future. We'll always be happy to see you back at WATU and would love you to keep in touch.